SailFast™ is a Windows PC-based navigation program with features that greatly enhance your sailing decisions, whether your goal is to go fast and win races or to cruise off-shore safely. 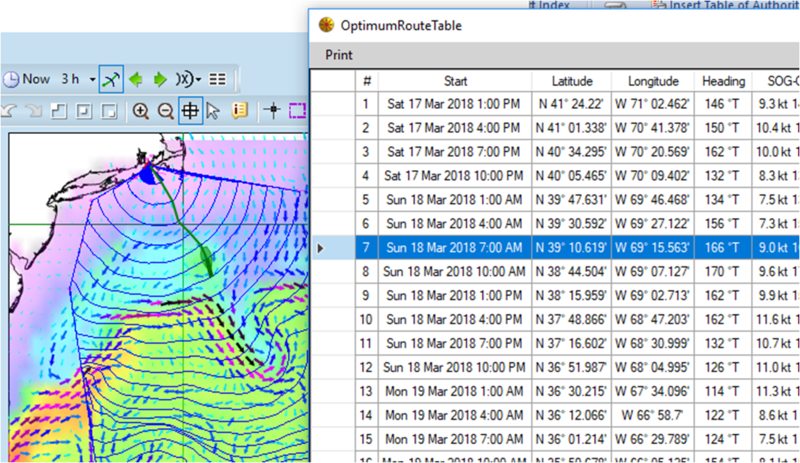 View Grib file weather and ocean forecasts, and derive optimum weather routing solutions using your boat's polars. Interface to GPS and other boat instruments and see everything you need at your nav station. Version 10 Released March 2019. Great new features include high resolution Gulf of Maine tidal currents and waypoint laylines. Only SailFast gives you access to these hourly forecasts out to 72 hours (3 days). From Naragansett Bay to Halifax, NS, including the Bay of Fundy. Perfect for the Marblehead - Halifax race. Read our new App Note. Chart and detailed data table for each routing segment are synchronized for ease of analysis. Give your crew the critical information they need to anticipate sail changes and go fast. Data includes heading, target speed, wind (apparent and true), SOG, COG, current. We share some of our customer's successes. Using SailFast in some popular off shore races.